Summary: What happens when teachers asks elementary students to conduct research about relatively recent history? In this article, a writing project teacher offers a wonderful model for integrating authentic writing and social studies instruction. 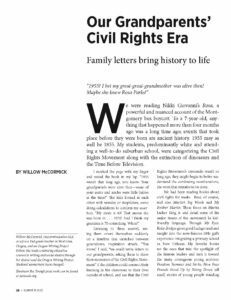 By exchanging letters with grandparents, her students build a deeper, personal connection to history while deepening their understanding of the Civil Rights era. Listening to them marvel, seeing them orient themselves suddenly on a timeline that stretched between generations, inspiration struck. “You know,” I said, “we could write letters to our grandparents, asking them to share their memories of the Civil Rights Movement.” If the children could connect their learning in the classroom to their lives outside of school, and see that the Civil Rights Movement’s crescendo wasn’t so long ago, they might begin to better understand the continuing reverberations, the work that remains to be done.